Sony has announced a high-end 'normal' prime for its Alpha E-mount line of cameras: the Planar T* 50mm F1.4 ZA lens. As the third normal prime for the system, we wanted to know what it offers over the already excellent FE 55mm F1.8 ZA, so we set about performing some benchmark tests. We'll take a look at sharpness on this page, and bokeh, coma, and longitudinal chromatic aberration on the next. Below, you'll see a series of aperture progressions for the 50mm F1.4 ZA and 55mm F1.8 ZA. Have a look around the scene at various apertures to get an idea of the capabilities of these two lenses - with the caveat that this performance is only representative of our single copy of each lens. Wide-open, the 55/1.8 is slightly sharper than the 50/1.4, both centrally and peripherally (the advantage is retained on the left side of the frame as well, despite the fact that our 55/1.8 is slightly decentered and has poorer left side performance). But none of this should be too surprising, since sharpness at F1.4 is far more challenging than at F1.8. In fact, the 50/1.4 holds up very well considering the 2/3 EV disparity in f-stop. Comparing both lenses at F1.8 (a more level playing field), the 50/1.4 catches up to the 55/1.8 in terms of center sharpness, but still lags in peripheral sharpness on the left and right sides of the frame. By F2, though, the 50/1.4 just surpasses the 55/1.8 in central sharpness, though off-center it still lags a bit. By F2.8 though, the 50/1.4 pulls ahead of the 55/1.8 even here off-center, and particularly at center where it pulls and stays ahead at higher F- numbers. Peripherally, though, the 50/1.4 never quite catches up to the 55/1.8, not at F2.8, and not even by F5.6 (the lenses are a bit more even on the left side at F2.8 and F5.6 due to the weaker performance of our 55/1.8 on the left but, technically, the F1.4 is still a little bit behind). The new 50/1.4 ZA displays impressive sharpness and contrast at F1.4. Our copy didn't hold up as well as the 55/1.8 wide open, but displayed particularly respectable performance considering the 2/3 stop light and depth-of-field advantage. These new lens designs deliver sharp and punchy images wide open, instead of the soft and hazy images you may be used to getting if you slap on old F1.4 designs on such high resolution sensors (remember that we're using the unforgiving 42MP a7R II for this test). That said, the new 50/1.4 does not retain this sharpness across the field as well as the 55/1.8, which offers better field uniformity at all apertures. 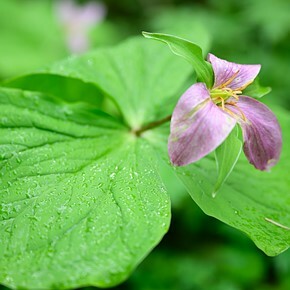 By F2, though, the new 50/1.4 ZA matches the 55/1.8 in central sharpness, and surpasses it at all smaller apertures. Considering the high bar set by the 55/1.8 ZA, this is very impressive. However, you give up off-center sharpness at the widest apertures. If we were forced to pick an overall winner here in terms of sharpness, we'd probably go with the 55/1.8, but really there isn't a huge difference between the two, particularly when you factor in the realities of copy variation. It's worth noting that Roger Cicala at LensRentals found the central sharpness wide open of the 50/1.4 to exceed the 55/1.8 (see MTF traces above), while our visual results don't show the 50/1.4 to exceed the 55/1.8 until F2.8. We can't rule out the possibility that our copy of the 50/1.4 slightly under-performed relative to the average, perhaps due to decentering; however, it's reassuring that he found the 55/1.8 to offer greater uniformity. This difference in peripheral sharpness may be the reason for the apparent discrepancy in our results, though copy variation is also highly likely to play a role (note that the worst performing 50/1.4 Roger tested was significantly worse than the best 55/1.8). To elaborate, below we show our infinity scene overlaid with red and blue rings representing image heights of 4mm and 16mm, respectively: the two points where the 50 lp/mm MTF traces of the two lenses intersect. Between these rings, Roger's 50/1.4 tangential 50 lp/mm trace falls below the 55/1.8. Hence, our visual shootout seems to agree with Roger's results: aside from a very small region in the center, the 55/1.8 does outperform the 50/1.4 wide open (though we don't see the improvement towards the edges of the 50/1.4 that Roger sees: our 55/1.8 remains ahead peripherally). And, again, we may have tested a copy that under-performs relative to the average, which Roger's data is more representative of. Our infinity scene with red and blue rings that represent 4mm and 16mm image heights (distance from center in the image circle). Between these regions, Roger's own MTF data indicate a dip in tangential resolution. 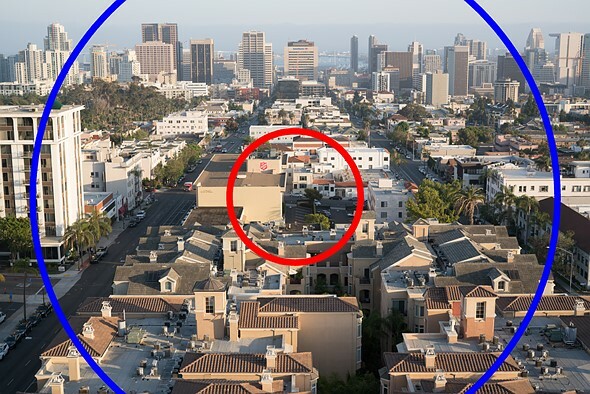 It may only be a small region in the center (within the red circle) where the 50/1.4 significantly out-resolves the 55/1.8 wide open, which would explain the apparent discrepancy between Roger's results and ours. Copy variation is also likely to play a role in the differences - we only tested a single copy. All that said, sharpness isn't everything. How does the new 50/1.4 fare in terms of bokeh, coma, and purple/green fringing? Let's take a look on the next page. I got a question regarding the far behind focus plane bokeh test. Did the cameras focus at the same distance / object? The circular highlights seem to be equally large. However, the 1.4/50 bubbles should be larger. Or was focus adjusted, so the bubbles have the same size? Focus was adjusted so the 'bubbles' were the same size. That allows you to compare smoothness for equivalent amounts of background (or foreground) blur. Put the widget upon a roof in the foreground: Here the Planar 50mm is better than the 55mm lens; both lenses are on a par not before f4! In the background, though, it's the 55mm that's always ahead. This makes me wonder if and to what extent the sharpness results here might be affected by distance settings which weren't the same at both lenses. BTW, these lenses vary a lot as to their weight which IMO indicates what they are made for: The Planar 50mm is rather a specialist for portraiture, fashion, studio works, and the 55mm is rather an all-rounder. "But for subject isolation that puts medium format to shame,while retaining respectable sharpness and contrast even far off-center wide open (and particularly by F2), the FE 50mm 1.4 ZA is the lens to own." Surely any reasonable normal lens on a medium format camera would have even less depth of field and hence greater isolation than that produced even by a fast lens on 35mm format. To my knowledge, no medium format digital camera currently has a F1.4 equivalent lens for it (there may be one or two, for the largest sensor sizes like the Phase One 100MP back). So I meant what I wrote. Please read this article to understand better why full-frame is currently the 'sweet spot' for shallow DOF lovers. Generally speaking, full-frame currently offers the shallowest DOF of any format. Sigma's 24, 35, 24-35, 50, and now 85mm Art Line are truly great lenses. I love this lens, and will definitely use it in many situations, but stop down focussing is disappointing, and I hope Sony will move to a different approach soon. The suggestion appearing here (keeping wide open during live view then stopping down for the shot, with focus shift look-up tables to correct when needed) seems likely to produce much more useful behaviour. 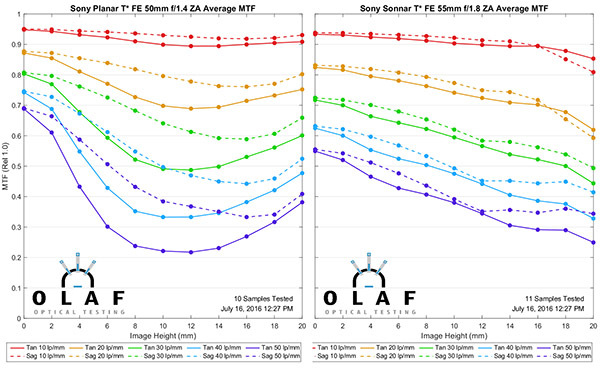 It is really amazing: 4 out of the 10 top performing lenses at DXOMARK are Sony FE mount lenses. That’s more than either Canon or Nikon. 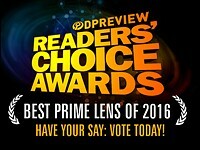 7 out of the top 20 best performing lenses are Sone FE mount. Only Zeiss Outis is on par with best Sony FE. 2 things to consider. 1: Rating is related to resolution of the sensor tested against. Many of the Sony lenses are newer and were tested on higher resolution sensors. 2: Production consistency is also important. Sony has one of the worst consistencies in the industry...decentered optics are more common on Sony lenses. I found that the combination of sensor and lens is the relevant measure. That is exactly what you will get on your pictures. Look at Canon who released 50Mpxl sensor, but we dont see the combination of Canon sensor and lenses being able to resolve 50Mpxl. What use is that high Mpxl sensor then? Sony on the other hand manage to get almost all sharpness out of the the combinatuion sensor and lens. I like this new lens. Why? Because of it I picked up a pristine used copy of the FE 55 for a very good price. Amazing how none of these reviews talked about AF performance yet.. Please read the footnote on page 2. It's not great, but it is accurate. Loxia 50mm for the win. Was joking. All 3 lenses have their place and it really depends on what the photographer is after. My Loxia 50mm is currently for sale and I was thinking about pulling the trigger on the FE 50mm 1.4 ... it's a beast of a lens from what I can tell. So... when are we gonna throw the new Samyang AF 50/1.4 FE at these 2 Sonys and see what happens? The 1.8/55 is a peach. When will we have available and if now, where is the info on the 1.4/50 transmission? I'm betting it will be insignificantly faster than the 1.8/55 which is fast, sharp and has high contrast wide open. The Sigma Art is no faster than the 1.8/55 when adapted, I've tested and my camera (7RII) exposes the same scene with the exact same settings using the Sigma at 1.4 and the Sony 55 at 1.8. 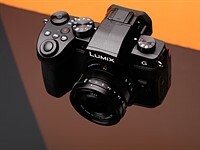 The Sigma is only slightly faster and must lose some light in the adaption, even if the new Sony is slightly faster, it may not be fast enough to justify the weight, size and cost. How do you figure a glassless adapter robs light? DxO gives 1.6 T-Stop to the Sigma and 1.8 to the Zeiss. How exactly did you test for equal exposure, just through automatic shutter/aperture? Not exactly scientific to rely on Sony auto-exposure. Exactly that way, I find even a doughnut adaptor robs a tiny bit of light, not sure how, probably only T0.1-T0.2 at the most. I'm not pretending this is the most scientific of tests and thus the data is subjective at best, however, I've also found DxoMarks tests (and others) to be very obviously incorrect in real world tests. One instance of DxO being out by a country mile is their rating of the Samyang 2.8/14 on the D800E compared to the Zeiss 2.8/15 on the same camera. The Zeiss rates higher than the Samyang in every way, but the Samyang gets a higher score. As you can see, the Zeiss results in better performance in all aspects, more resolving power, slightly better transmission, less vignetting, SIGNIFICANTLY less distortion (which means even more resolution in real world use after correction) and less CA, all of which is easily understood from using the two lenses or just speaking to users of both. But the Samyang is rated higher. 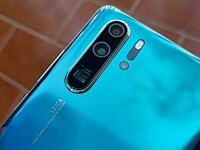 It's just one example of why DxOMark results an be good and frustratingly difficult to understand. For about the same size and weight, I think I'd get the 50mm f1.4 Art lens with the adapter, from Sigma. It costs about the same as the cheaper Sony, but it can be used on a Sigma SD Quattro H, which should out-resolve anything else under about $10,000. I do find it weird that these tests show the f1.8 to be sharper on the right side of these samples, while the f1.4 lens is sharper on the left side. I think the Sigma is bigger and with the adapter is about the same price. It's also third party AND used via an adaptor, so reliability is poor. I've had my 7RII shutdown due to MC-11 issues. What does 'reliability is poor' mean, and on what reference is is based? How do you know your camera shut down due to the MC-11? The way Sony is doing AF these days, I'd bet adapted lenses will perform at least as well stopped down with Live View. I mean on multiple occasions my A7RII shut down and wouldn't come back until I removed the MC-11 and mounted a native lens. The MC-11 isn't a professional, reliable solution and in no way gives the user perfect native lens performance. See my post above, the 1.8/55 Sony has the same transmission as an adapted Sigma 1.4/50 Art, but focuses MUCH faster and more accurately, has zero reliability issues and is smaller, lighter and cheaper. The Sigma 1.4/50 is a great lens for DSLR users, but not a viable option for Sony FE mount users. The new 50mm F/1.4, and all the GM lenses AND at least the Sony 55mm F/1.5 ZA with updated firmware behave like this. They stop down the aperture before focusing in AF-C. This makes these lenses about as valuable for photography as a paper weight. This is a HUGE error on part of Sony and it requires an entire article, not just a foot note. It's particularly galling that Sony did this to the 55mm via a firmware update, I could just have stayed away from the new GM and 50mm, but I did not expect a firmware to EFF UP my lens. And this is a serious eff up. I learned that from my own mistake of updating the firmware of my NEX7. Every time they said "better image quality" it was actually worse as camera was applying "enhancements" to raw. I will never ever update anything on my A7RII. Lesson learned. Too bad I will keep using lossy raw. The Sony cameras and FE 55/1.8 always behaved like that, this didn't come with a firmware update. The last update 02 for the FE 55 is from 03/15, btw. My FE 55 1.8 always focuses wide open. It's a 1500 USD-lens, still we are talking about lens variation. This isn't a quality that's peculiar to Sony, most lenses from most manufacturers exhibit sample variance, regardless of cost. Maybe Leica hand tests every lens that leaves their production line with industrial equipment (somehow I doubt it) but most other OEM don't... I guess they've done the math on potential returns and they're at an acceptable level, the onus is on users to test their stuff and most don't. Basically if you do, and you take advantage of return policies when warranted, you've come out ahead; because better QC would only mean higher costs. You are probably right, but for most non professional users, testing the equipment is not practically possible. So we have to rely on the company. Actually, it's not hard at all to test for some of the most common QC issues like decentering... Don't need any fancy equipment, heck you don't even need to resort to test charts or brick walls. Search the forums for methods like the 'four corner test' or the 'inverted red'. All mass produced products are copies and are different to one another. Sample variation is of no importance to users, only testers. Apart from running a (small) multimedia company, I run a multinational manufacturing company. The consistency of the high quality product we produce (high end, very similar to where Sony is aiming) is important. Variances in our product don't matter too much, but the customers want their monies worth and they deserve to be delivered the same quality that everyone else has, the standard of performance they were told to expect. We've an instance where sample variation returned an unhappy customer, luckily we corrected the issue and kept him as a customer, perhaps some had been disappointed and never returned to the brand? I had an issue with a Tamron product many years ago and lost faith in the brand, many have told me to try another. My first (and only) impression of the brand was probably tainted by sample variation. As a Sony customer purchasing products that command two to three times the price of 'similar' products, I'd like to think that I'm not purchasing a bad copy. Yes, and especially if that "product" costs 1500$. All of Sigma's art series are extensively tested with some of the best equipment. 55mm holds its own place, it seems. Corners and even middle sections look better than 50mm. 50mm has much less CA though. Taking price and weight into account I can't see why anyone should prefer buying this 50 mm lens. I guess it's a lens for studio works, maybe optimized for short distance shooting. IMO Sony should take more care of quality control in lens production (rather than designing any new lenses there's no need for). There's much complaining about Sony lenses to be decentered. If Sony want their brand name stand for high optical performance, they must deliver! LR tested the variance and stated that this 50mm variance is on par with other manufacture, not the usual Sony's poor QC i guess. Or poor QC no more? What methodology? Please be specific. Fred is showing that you were basing your findings of dip in acuteness on the diameter rather than the radius and that 16mm from center is actually near the edge. That said, this doesn't at all mean our methodologies are suspect - in fact, this finding probably strengthens our initial argument. That a fairly large portion of the image concedes an advantage in tangential 50 lp/mm MTF to the FE 55mm, since the region in between red and blue circles only appears larger now. So, if anything, this finding just strengthens our claim - so why you use it to claim our methodology is 'suspect' is odd. That said, we def do not find that our copy of the 50/1.4 was sharper than the 55/1.8 within that red circle, so there's still something going on here. Probably a poor copy. Suppositions aside (poor copy), I was not out to get you. I didn't even check who did the measurements. When DP presents a scientific argument, peer review is the great check and should be welcomed. When is the SAL50F14Z vs SEL50F14Z comparison coming up? Or has Sony told you not to compare between A-mount and E-mount? You appear to suggest that we're at the behest of Sony's desires and wishes. Just so I understand you - is that what you're implying? Furthermore, You do realize that the MTF curves suggest this E-mount would absolutely obliterate the A-mount version, right? So why on earth would Sony want anyone to not compare the two? You can't possibly think they want to preserve sales of old A-mount lenses over new E-mount lenses, could you? Furthermore, how would such a comparison be relevant? Why would you even bother adapting a SAL5014Z to your a7R II, with all the AF restrictions? Yep, because none of the world largest reviewers in the world, including DxO and DPR, are conducting A vs E-mount comparison. Actually, I was surprised when DxO pulled a SEL2470GM comparison against Canon and Nikon SLR equivalents with no mention whatsoever of the A-Mount own SLR equivalent, the SAL2470Z2. 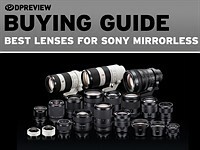 I believe, This is very critical since Sony is leaving A-mount users in the dust and direct comparisons between similar A and E mount lenses should provide a clear veredict if it is better to sell A-mount equipment and get E-mount instead. I have a Sony a7Mk.2 and several G and CZ lenses but all of them are A-mount, including the SAL50F14Z. There are some benefits staying with A-mount lenses (like having a mechanical coupled MF ring for MF work or Video) vs E-mount Focus-by-wire lenses.. Or being able to compose without having the lens close the aperture even with Live-View Settings OFF. And why should I just take a look at MTF charts to consider hitting the pre-order button? Wouldn't it be better to have DPReview do a great article to see if A-mount glass is still relevant for Dual A-E mount users like me? You can do a direct comparison of the 24-70/2.8, 70-200/2.8, 85/1.4 and now 50/1.4. Trust me, there is a ton of people out there still using their SAL2470Z and SAL2470Z2 on their E-mount cameras. A direct comparison between the A and E-mount versions could give you several hits on your website. I have, in the past few weeks, moved from a complete Canon setup to a complete E-mount setup, off-loading a ton of Canon glass that I knew and love(d). I did the adapter thing for a while. Silly really once I took a serious look at my needs and requirements. I ditched the adapter and I ditched the glass. Main reason was hassle. One more piece of gear. Sony is moving away from A-mount, or seriously de-focusing on it. Assuming otherwise is delusional. They are not going to compete seriously against Canikon in the future with all of their focus on the E-mount, so A-mount stuff is going to depreciate faster. Dump it now while you can still get some cash for it. A year from now it'll have dropped seriously in price. I've adapted many A mount Sony optics to FE mount via LA-EA3&4. The only optic worth adapting is the 1.8/135 IMO because there is nothing like it available in FE mount from any manufacturer, it works better (via the EA4) than anything similar from Nikon or Canon via Metabones and it's a brilliant lens. The 50mm and 85mm A mounts are very average and worse when adapted. You would think a renowned name like Zeiss would care more about the qaulity control of its lenses. I've had to return two horrible copies of the 16-35 fe and my 55 is nothing to right home about. Seems they have some wild copy variation. I would think you would care more about the QUALITY control in your posts. What you WRITE should have correct spelling. Otherwise you come across like a teenager sending a dumb text rant. Oh, thank you kind sir. This article should have been entitled: "The case for the Sony 50mm 1.4." It's clearly a nice lens, but (1) better? Arguably, but only marginally; (2) I don't get the point of Sony creating a new much more expensive lens to "Knock off" the 55 1.8, which while also expensive, has, along with the F2.8 90mm, been arguably Sony's best ever lens and provided an iconic, almost legendary reputation for what is possible with mirrorless cameras, while (3) still not solving the gaping hole of mediocre quality of its standard zooms. At the moment, for every day shooting, I am mostly using a Sony f 3.5 to 5.6 18-135 A mount zoom with LAEA3 adapter with my A6300(better than 16-70 f4, and more range), and an F2.8 Tamron 24-70 with my A7rii (still best standard zoom for the camera). I do this to get closer to the potential sharpness these cameras offer. But neither works with Eye focus, or delivers the focus speed the cameras are capable of, so still trade offs. I think most would be better staying offline measurebaiting over 1.4 lenses and actually going out to shoot. You might be surprised what actually will work best for you when you give it a try. I COULDN'T be MORE UNHAPPY with Sony's choice to close down its lenses for focusing. 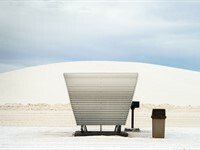 I recently shot a campaign in Australia; we had bad weather and had to move to studio. In fashion and beauty it is pretty common to shoot in studio at f11 and up ... I found out quickly that Sony CANNOT focus accurately (CLOSED DOWN) under modeling lights at those apertures! This makes no sense!?!? I got through the shoot, and I love my A7RII's but I will definitely rent for studio shoots until they sort this. SO GLAD of the focuse accuracy of not using a look up for focus shift ... Oh wait, it doesn't matter cause it can't focus anyway!?!?! VERY DISSAPOINTING for a great Camera and great high end lense set. I look forward to the fix and retracting the above. Thanks for your understanding. Not many people have really understood how bad the situation really is. It seems that Sony could do a software update to allow focusing at the selected aperture or wide open. We shouldn't have to choose. @Alec Watson I've been talking to Sony about this for a while. Still no response. You are experiencing exactly what Maurizio and I are experiencing. It's a serious issue (well for me anyway) I don't understand why they have went against the grain and changed the behaviour of the lens diaphragm protocol. The automatic lens diaphragm was invented 50 years ago to enable faster AF because the diaphragm is always left wide open until shutter actuation. Curious that those things are never mentioned in dpreview articles... The overheating while shooting 4K is another example. I totally second that. I shoot features and lifestyle in NYC. If in dark location and want to use a fill flash at f:4-5.6, the Sony struggles to focus more than my old Nikons. You may lose the subjects' attention in the meantime. It would be nice if Sony would also consider working photographers' needs. The Minolta 50mm f:1.7 ( $40) focuses faster + wide open on the LA-EA4 than the Sony 50mm 1.8. The 55mm 1.8, focuses wide open, I am worried the next firmware update may break that. @John G Moore any way to have more photographers contact Sony? I sold some Nikon equipment, but if Nikon came up with a mirrorless system with F mount I may switch back (although it seems Nikon is following Sony's footsteps by jacking up prices of the newest lenses). I don't really see much point in being indignant about this. It's clearly better, but you clearly pay for it. As one might expect. I could never justify paying double for something with only marginal advantages over the 55/1.8, which is really a very good lens. But by the same token, even the 55/1.8 feels quite expensive to me. Photography these days is a pay-to-play situation. As it stands, I'm quite happy noodling around and finding pleasing compositions with my affordable M4/3 and APS-C gear, and an assortment of legacy lenses. I thought the 55mm was already overpriced, but this 50mm is unjustifiable. The eye of the model is out of focus actually. The eye lashes are in focus but the DOF is too shallow of the iris to be really sharp. The really shallow DOF is a fad that will make photos feel very dated quickly. I think it is a bit of a reaction to cameraphone images. Anyway I got the 55mm 1.8m, and also a Minolta 50mm macro with LAEA4 that is also very nice and pleasing, for a fraction of the price. Anyway I agree the stopped down focus is bad, it should be optional. I shoot people often in non static situations, and quick focus acquisition is more important than instant DOF feedback. Luckily the 55mm focuses wide open. For landscape photographers it may be a different issue. Thanks DPreview for letting Sony know about the issue, and I would add my signature to a petition if there was one. Would be nice if images were taken at the same time instead different shadows are cast that makes comparison a bit difficult. I figure DPR would have enough gear at their disposal to do such tests! To me the 1.4 is not different enough to justify the price. The 1.8 is already PLENTY expensive! The test-comparison about coma is naively poorly done. Does not show the actual coma defect that occurs always, in its maximum intensity on the end of the frame corners. Obviously this is badly done, the most distant, small lights had to get up to the top edge of the image. Come on, how do you think to propose this?! This is exactly why I moved away from Sony, premium lenses that don't quite justify their prices. Not only (unjustified) premium cost, but big and heavy, completely canceling the main reason for having a mirrorless camera. I have mirrorless because of EVF and ability to use old lenses with focus magnifier. I couldn't care less about size or weight, although it's nice to have a small camera. I never said they don't have any good lenses, I said they don't justify the prices. None of the Sony Zeiss lenses outresolve Sigma's cheaper Art lenses and the 70-200 FE might be the most overpriced lens I have ever used. I was completely underwhelmed with that thing. Except if Sigma and Tamron did not exist, Sony arguably has the best performing 50-55mm in existence for the money. Pay your respects to the third parties for creating products that have shifted status quo. Honestly they have done more to protect DSLR sales than DSLR manufacturers which is honestly frightening in some ways. We are comparing a Sony native lens to Sony native lens. Putting it up against your brands 50mm will open your eyes (unless again we are talking Sigma). 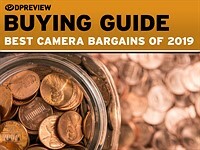 Canon and Nikon should be paying Sigma and Tamron for royalties and licensing and not vice versa lately. i have exactly those lenses also and and with my 7rii make miracles!! 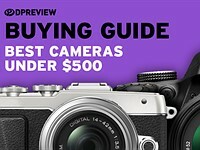 Sony prices are more or less in line with Canon and Nikon prices. Except you compare prices of 10 yo used Canikon equipment with the latest released Sony stuff, then you should use that. Ah, man - I wanted to compare the sharpness of the plane, but it was only in one image ... should have waited for another one! I went to a meeting Sony had in Iceland a few months ago, they introduced lenses & some sony bodies. They claimed "our new lenses are so perfect that they dont have any onion rings unlike ""all"" other lenses" Basicly they're claim and they talked for 2 HOURS about how they had superior lenses and how there were no onion rings, they made sure to beat every point into people including the onion rings not existing. It was 4 hours of talking that could be a 10 minute thing because they hammered the same claims OVER and OVER about the cameras and lenses, half the room had left before they were done talking before we got to test the gear because everyone had gotten annoyed that they wasted everyones time. I managed to get onion rings right away with they're lenses & cant say I am impressed. I demanded to test it with uncompressed & full res which makes a huge file but yea. I think they had it on different settings which would mask the onion ring effect. My faith in Sony is gone sadly. Panasonic made a lot of noise a while back about developing a brand new manufacturing process to eliminate onion-ring bokeh. I believe the 42.5/1.2 Nocticron was the first fruit of that labour. It wasn't eliminate, just reduce, and they seem to have improved over their previous lenses (which of course were the comparison points), but I'm not sure that put them ahead of the others. I suspect most of the examples of the "others" that may be referring to simply don't use aspherical elements in those particular lenses. 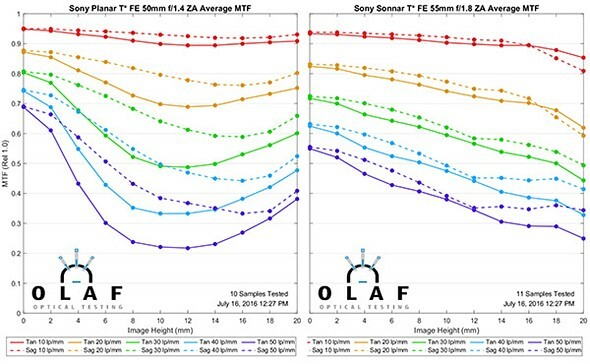 The majority of standard fast 50, 85, 100, and 135 primes designed for FF DSLRs use only spherical elements, in stark contrast to newer designs for smaller sensor mirrorless cameras that have higher resolving requirements out of their pixel-dense sensors. Panasonic were the first. They said to be eliminating (or reducing?) those onion-rings in bokeh by preparing the relevant aspherical lens elements; since it's handwork it's costly and reserved for pricey lenses. Not much later Sony declared they had found a way to let a machine do that. Therefore you might expect the 55mm and other high quality lenses will get improved in the said sense. I just don't think anyone else bothered to make anything of it. It's a simple theory, just try and smooth out the tool marks. 1000$ for a full frame nifty fifty 1.8 are a ridiculous price. Also considering its performance. Similar lenses for other systems cost 100-300 $. 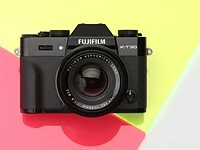 It also defeats one of the main points about mirrorless: small size and weight. This is the longest and heavies in its class. i think you speak about 55 1.8....., i used to think like you untill i bought one...FE55 deserves every penny requested. what a gem. Right?? I mean heck, while we are at it, what's up with the Zeiss Otus 55 f1.4 costing $4,000? Similar lenses for the same systems cost 300-$1,000. Methinks you are getting too distracted by f-stop numbers, and not realizing that actually having a sharp lens wide open actually costs money. Canon's 50mm f1.8 is a fantastic lens for its money, but it is in no way sharp wide open at all. Neither is their 50mm f1.4. i have the 50mm 1.8, the 55mm, and Minolta 50mm 2.8 macro. I like the 55mm a lot, but at f4 / 5.6 the 50mm is up there. But the issue is that the Sony 50 focuses stopped down and hunts. It feels handicapped. The bokeh of the Minolta 50mm macro looks a little smoother to my eye and maybe appears a little sharper in the center (also warmer color)l. Anyway I got the 55 for a good discounted price, after returning a used one that was not sharp. In any case i do not see the advantage of getting the 50mm 1.4.
the Sony 50mm 1.8 is overpriced as well given the poor and unreliable AF performance. The 55mm 1.8 is frequently on sale in US for $800. I have a cheap pre-owned Nikon 50mm 1.8G and it is *barely* sharp enough for a 24MP FF sensor. Actually it really *isn't* sharp enough, but with post-processing the end results are good enough for *me*. In addition when shooting candids and weighing motion blur with continuous light, I see no reason to really need a more resolving lens, but I *do* know these Sony's are hitting another class of primes that when shot wide open can still be massively cropped (i.e. digital zoom). This is not the same category something like the Nikon 50mm 1.8G can achieve but I am absolutely fine with that because I am not going to use my 50mm 1.8G as something that can digitally crop as a tack sharp 75mm equivalent, etc. To get the most of these Sony primes you need to be shooting in good lighting or using strobes IMO. I bought the 55mm after all. probably around $750. Yes it is good and I like it. but at f:5.6 and on the 50mm 1.8 is not that different. The issue is that the 50 focuses stopped down, which is a problem, while the 55 focuses wide open even when stopped down. SO the AF performance is very different. ijustloveshooting: I payed 92$ + shipping for my full frame DA 50mm f/1,8 and its optical quality is comparable. Lower build quality, yes, but it focuses fast and accurate and are sharp corner to corner wide open. Bhima: The Sony 55 are not perfectly sharp ether. The optical performance is comparable. Wide open, corner to corner. Obelix: That full frame priced Sony lens are only APS-C, so I don't consider that comparable. That leaves me wonder even more how few would buy the 55/1,8 in stead of the cheaper 50/1,8 or the better 50/1,4. 55mm is faster focusing than 50mm 1.8. It is too expensive, but it is very good quality. On the APS-C cameras, there is the Sony 50mm 1.8 OSS. Better build quality than the 50mm FE, faster focusing, and image stabilization. Better build / value overall but not full frame. 50mm 1,4, do not see real world use. Also its AF works stopped down, so probably the 55mm 1.8 will focus way faster in most outdoor situations when you close the aperture a bit. Re: the recent AF controversy, if I have to choose between accuracy and speed, give me accuracy, please. You haven't got the point. At apertures smaller than f4 you're losing both, speed AND accuracy. If you focus closed down, you CAN'T physically separate planes, even with the most accurate AF system in the world. Test and you'll understand. Exactly what Maurizio said. At small apertures, where you're literally giving up PDAF, your CDAF system can't possibly be as accurate - as extended DOF means the CDAF may not even see the difference between ideal and non-ideal focus. Meanwhile, even if your PDAF system still functions, it's not functioning very well - because more oblique light rays that would register more of a phase differential to calculate the offset by which to adjust AF will be blocked. You're literally killing the phase-difference between 'left-looking' and 'right-looking' pixels. Rishi: I PM'd you about this - did you receive it? @Rishi please convey this to Sony. I shoot lifestyle stuff. I like to use f:4 or so in interiors, to have sufficient DOF, but I lose focus speed, if I use a speedlight it is even worse. I do not see many Sony Artisans who shoot beyond landscapes on a tripod. At the end of the day, reliable AF may matter more to a professional than slightly better bokeh. Understood. Thanks for the clarifications! @stefpix: Trust me, I have :) To multiple engineers on multiple occasions. I trust they're definitely at least thinking about it at this point. I'm curious though, you say: "At the end of the day, reliable AF may matter more to a professional than slightly better bokeh." What do you mean by that? Curious why you're suggesting a trade-off between AF and bokeh? Sorry if I'm missing something obvious. Hey Maurizio. Just had an interesting conversation with Sony. I'll drop you an email. Wow! Is that a B737?? Quite a nice shot! It seems a good place to take some interesting photos of landing planes above the cityline. High precision exercises to justify the obvious: Different glasses aiming at different purposes even at a slightly different niche. Given that both lenses are to be used for high end photography sometimes I think that post processing can deliver desired results at a fragment of cost and no one will ever notice. Well, I would be happy, if we can choose between "focus at chosen f-stop" and "focus stoped down" over a function. Just to test the focus shift by my own. I know, I can simulate it. But as long as there is no "easy way" to use it later in reality, there is no motivation to test it. silly advertisement for a hugely over-priced and rarely advantageous product. Focusing behavior (focus at the chosen aperture and not wide open) of Sony Lenses is a big big issue in dim light particularly when using AF-C (best option to shoot people in studio). This is particularly bad because beyond f5.6 (but even f4) you really can't focus at all or, even worse, get focus errors even when camera says it's ok. Manual focus at the same time is much harder if you don't have the "wide open" view. I consider this a serious bug and a bad mistake from Sony. At the moment it's the only real issue with the otherwise fantastic A7 bodies and I feel particularly sad because I've invested a lot in the system without realizing that this behavior was present. No other camera of any other manufacturer has this issue and would be easy from Sony to correct it with a firmware upgrade. Worse than that it wasn't this way at the beginning, it's a choice done only lately from Sony. A change for the worse, a change that really creates a problem for anybody shooting beyond f4. Focusing wide open or not is basically your own choice: In my A7II you make your choice under "custom settings" -3rd page, "live view display"- setting effect "on" or "off"
With this setting set to "off" focussing is faster and easier particularly in low light. Thanks for offering help mate. Unfortunately, you have no choice on the A7RII with G Master lenses. The lens diaphragm physically closes down even in AF-S Mode. 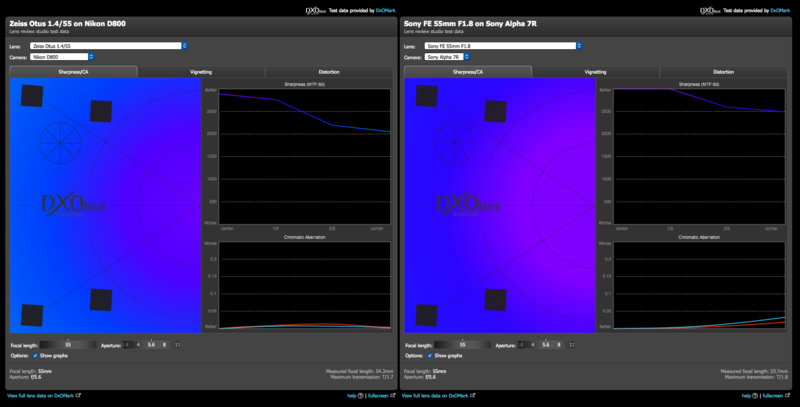 Live View setting has no effect on lens diaphragm behaviour either. It always closes down. Salient point due to the focus-shift effect/defect at different apertures of some lenses, right? It is my issue as well. All these Sony Artisan photographers seem to shoot landscape. Stopped down AF may not be an issue for them, but if you shoot people in a non static situation the stopped down AF is a real handicap. It should be a menu option. I could not use the Sony 50mm 1.8 to shoot an event due to that. I noticed if some subject has a tanned or dark complexion it makes the lens focus go back and forth . 55mm focuses wide open. it is fine with me. If i want to see the depth of field i can just take a test shot, but AF is not crippled. I am worried that is a lens is designed to AF stopped down the thing may not be reversed. Maybe in these lenses the focus plane changes with the aperture by design, making wide open AF impossible. @stefpix - I can say 100% this is a firmware problem. I have an a7R and 2 a7RIIs and just had a terrible time at a studio shoot in Melbourne - green lights for focus at f11 that weren't in focus. I have an a7R on old firmware - and it stays open at f11 - not fully open, but probably f4. There was a firmware update for "G Master Compatibility" - has nothing to do with compatibility - it closes down your lenses. I have asked to have my firmware rolled back on the A7RII's until they give an option. I am amazed by this bad news about recent Sony lenses stopping down whilst focusing. I have the 55/1.8 and 35/2.8 both of which do focus wide open in S and P focusing modes (but not A and M) on the A7R. My message to Sony would be that I simply would not buy a lens that auto-focuses stopped down without the option do do otherwise. Even worse, I have read in Lloyd Chambers 'DigLloyd' reviews that the A7RII (which I don't own) behaves like this with other lenses he's tested such as the Batis 25/2 and that this happens even when manually focusing. What are Sony thinking of !! @Alec - Interesting observation Alec. Will investigate further. @Sparky - Must check that Lloyd Chambers article out - wasn't aware of it. With regards to the bit about FE lenses focusing while stopped down - it depends on two settings. If set to AF-S, they will focus wide open, and then stop down when focus locks. Continuous focus or any sort of tracking causes them to stop down while focusing. Enabling live view effect will also cause it to stop down to the selected aperture. Hope this helps. Thanks for offering help mate. Unfortunately, this doesn't happen on the A7RII with G Master lenses. The lens diaphragm physically closes down even in AF-S Mode. AF Mode and Live View setting have no effect on lens diaphragm behaviour. With great respect, the G Master series of lenses do not offer the solution stated. They stop down ALL the time, making focusing at medium apertures in a dim studio where one is using strobes all but impossible when in manual mode, the mode most often used in studio with strobes by professionals. The argument that doing so eliminates focus shift and reduces shutter lag, is a spurious, as every other vendor, many with superior AF, and some with less successful AF systems all manage to Autofocus properly wide open. Focus shift is more indicative of poor element or gearing design than a "natural phenomenon" Of course, I could be wrong, but then so would be my University level optics class. Actually, focus shift usually results from uncorrected spherical aberration, so, in a sense, is a perfectly 'natural phenomenon'. A lens design that doesn't correct for it will experience focus shift without some sort of a LUT to correct for it. As mentioned by others your lenses are a bit uncentered. What you call a bit sharp or "lags behind" a bit, may as well be copy variation. 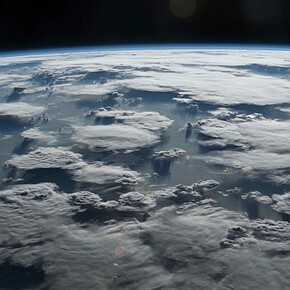 Try 2 different copies of the same lens and you will have similar conclusions. In these cases it will probably be better to take the sharpest out of 3 tested copies of each model to draw more robust conclusions. Hey, have you looked at the BOTTOM left and right at the picture? There the 50/1.4 clearly outresolves the 50/1.8, while on the TOP left and right the 50/1.8 wins as you stated. Could it just be that the two lenses are focussed ever-so-slightly differently so that the bottom which consists of closer subjects (compare the chimneys) could be just a tiny bit more in focus on the 50/1.4 while the objects further away at the top would favour the 50/1.8's focusing? If this is correct, then there is no inconsistency with Roger's results. 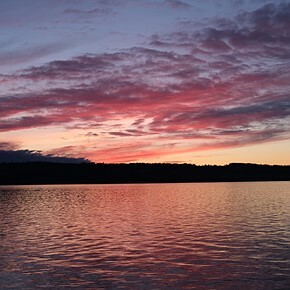 both lenses are not perfecly centered, so there is always a sharper and a less sharp side. I think the focus planes were not exactly the same(f1.7 vs f1.8). 50mm is sharper for nearer objects, while 55mm sharper halfway to infinity. And for the 50mm, the left half is sharper than the right side.. so maybe decentering or something. Ha ha.. great minds think alike! I get the idea: Sony's primary advantage with their current system is the ability to locate objects like a subject's eyes and get them in perfect focus at the widest apertures- and every smaller aperture as well. However, as Rishi notes, stopping down *too* much hinders the phase-detection functionality of the autofocus system: just like on a DSLR, there's just not enough light, and you're down to contrast detection (which typically means switching to Live View on a DSLR). Sony should pick an aperture where the system is still more or less optimal, say f/5.6, and use this as the 'maximum stop-down aperture' by default. This way, if there is focus shift at say f/11 (and no look-up-table as Rishi suggests) it will be partially accounted for- maybe even mostly accounted for- while AF will still be fairly accurate. Sony could also allow for the maximum stop-down aperture to be overridden by the shooter, should one need accuracy at f/11 or smaller as in macro work. f5.6 is not enough. I consider f4 the maximum acceptable. But wide open is the only real choice there. Maybe it will depend on the lens speed and shooting aperture? $700 is dangerously close to the FE 1.8/55, and their AF system is not likely to be as snappy assuming it's even salvageable for real-world use at all. I applaud Samyang's efforts here, but they really should have aimed for a less saturated section of the FE-mount- their 135/2 is very very good, and that's one lens that Sony shooters would love to have AF for! This information is at odds with the information from Lens Rentals which is taken from 10 copies of each lens. Roger's report implies we should see very different results than we do above. I'm not being facetious, was there an issue with focus or something else that may have gone wrong with these test shots? We've addressed this at the bottom of the first page, and Roger himself has chimed in in the comments below. Awesome, will search now, thanks for your time to comment Rishi. I trust and respect Roger and LR but there is something wrong with this story (The LensRentalsBlog results compared to the real world testing here). Roger et al test against the Otus and gets 10 Otii that are significantly off spec that Zeiss's testing. By random chance, DPR gets an abysmally low performer that seems to shoot as expected given the 'dream' MTFs published by the Zony crew. 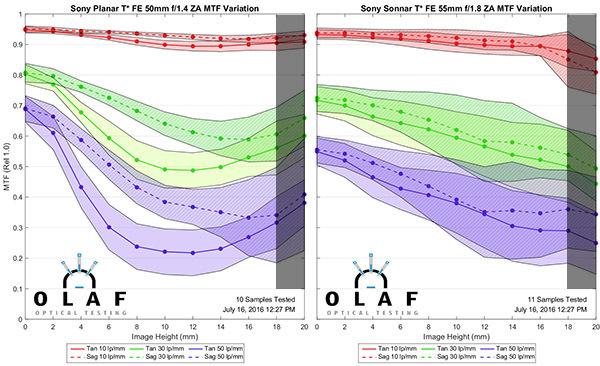 So how does it happen that 10 Otti test so poorly on OLAF and 10 of the new 50mm Zony test flawlessly, yet in real world testing the new 50mm Zony fails to keep up in resolution with the 55mm Zony? 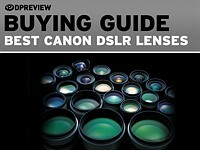 Is it possible that lenses sent to LR were cherry picked by the manufacturer knowing they might end up being tested and published? While DPR might have procured their lens through the same haphazard channels most photographers go through ? In my own MTF testing using Imatest, I've tested up to 5 lenses to find a suitable one that's in spec and seems to perform as advertised. In spite of the above issues, the coma control and lack of OR bokeh in the OOF highlights is an achievement. Last but not least, I am surprised by what is referred to as 'sharp' in the article. The model's right eye (our POV) is not particularly sharp considering a casual shot I just placed in my profile that was taken handheld at a low shutter speed with a manual lens, no flash and not at base ISO. the lashes are somehow in focus, but iris is not. Portraits should be shot at least at 2.8 to have both eyes in focus and possibly the lips. When will the wide open shallow DOF fad end? To me based solely on this test, the only reason you'd get the 50 f1.4 is for astrophotography due to the low coma. Otherwise the f/1.4 aperture seems to be of very little use as the Bokeh at f/1.4 is no more diffuse than the 55 at f/1.8. It is slightly smoother in front of the focus plane but minimal differences. The sharpness and resolving differences are also minuscule. Hard to see how this out resolves the Otus or Sigma. That's a 50mm lens, a standard, boring focal length. Too short for portraits, too long for landscapes, but it's something that you can put on the camera and take everywhwre with no high expectations. If it was small, light and cheap. Unlike this lens LOL. The 1.8 is definitely a better choice. > everywhwre with no high expectations. The kind of fashionably dismissive Internet forum comment that's revealing about the conceit, ignorance and apparently mediocre photographic efforts of the commenter, I suppose. I bought into the a7 series (a7, a7r and now the a7rII) for the sensor and the form factor. This lens is massive and eliminate the form factors which initially were so appealing. What happens when Canon and Nikon place and EVF on there next DSLR's? I will stay with the 55mm 1.8, the Batis 85mm 1.8 and the Loxia 21mm 2.8. You folks split the pixels and line pairs. 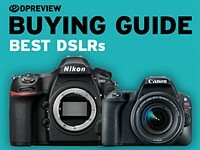 "What happens when Canon and Nikon place and EVF on there next Dslrs? " Your right Thematic. What happens when Canon or Nikon place an EVF on their next Mark 5D IV or a Nikon D820--we will be close to where the circle first opened. No reference to a SLR. Thanks. Sony already tried that and it didn't sell well. 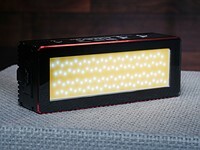 Check out the SLT-A99. I own the a99. Great camera--terrible battery life. My point here is simple--these lenses the Sony Zeiss 35mm 1.4, this 50mm 1.4 are huge and blow the form factor. If and when Canon or Nikon roll out new cameras that have the same form factor as the current 5D Mark III or the Nikon D810/D750 with an EVF option I would see much of the Sony mirrorless advantages evaporate. With Canon at least and their DPAF tech, the idea of an EVF (likely switchable with OVF) isn't that far fetched at all. I don't see a good reason why I should get the FE 50mm F1.4 over my FE 55mm F1.8. It was even sharper than the Zeiss Otus 55mm F1.4 at most F stops. While I have the 55 and love its sharpness, you should be more careful with those comparisons. The D800 has an AA filter, the A7R doesn't, which makes a big difference in effective sharpness. You should do the comparison using the D800E. Did you ever get correct colors from 55 1.8? I hate the magenta cast in all of its photos. Try shooting people on green grass, it´s impossible to get the right colors. And what about paper cut 2D when you shoot people at f2.8? There is much more to lens than just sharpness. The Sony FE 55mm F1.8 ZA Carl Zeiss Sonnar T* is one of the first lenses for Sony's fledgling full frame mirrorless system, and designed as a fast 'normal' prime to complement the Sony Alpha 7 and 7R. However at around $999 / £900, it costs several times as much as the 50mm F1.4 options for DSLR systems. So what exactly are you paying for? Click through for the lens test data and our analysis. Sony has announced no fewer than five 'FE' full frame E-mount lenses to accompany the A7 and A7R. First up is the FE 28-70mm F3.5-5.6 OSS, an image-stabilised 'kit' zoom for the A7. There are three premium lenses with Zeiss badges: the FE 55mm F1.8 ZA Carl Zeiss Sonnar T*, the FE 35mm F2.8 ZA Carl Zeiss Sonnar T*, and the FE 24-70mm F4 Carl Zeiss Vario Tessar T*. The fifth lens is a 'G' class telezoom, the FE 70-200mm F4 G OSS. Sony has also updated its Alpha-mount fast telezoom to make the 70-200mm F2.8G SSM II.